Scientists utilize simulations and laboratory experiments to find that cells sense the mechanical forces to form the primordial eye, the optic cup. Research: If you want to build an organ, such as for transplant, you need to think in 3D. And now a team at Kyoto University's Institute for Frontier Life and Medical Sciences has gained new understanding into how cells undergoing mechanical strain create the spherical structure of the eye. Illustration: Actin accumulation within individual cells (movie S9). 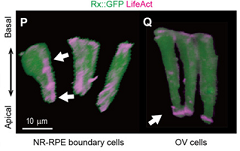 Actin aligning along the apicobasal axis in the NR-RPE boundary (P) and actin accumulated around the apical surface in OV (Q). Science Advances, 2018; 4 (11): eaau1354.